An Ancient Chinese Beauty Secret for Over 3000 Years. The Secret To Longevity And Radiant, Young Looking Skin. Our Seawater Pearl Powder is 4000 mesh for Perfect absorbability and efficacy. We aced the tests by WHO GMP for product control, integrity, purity and safety. They guarantee that our product is of Most astounding quality. We have a "NO REFUND" policy on bulk orders. Please order 1 oz sample size before purchasing bulk pkgs. Pearl powder - Finely milled powder from quality seawater pearls and its naturally compatible and easily absorbed by the skin and body. The medicinal and beauty benefits of pearls have long been known to the Chinese, proven non-toxic and harmless to ingest and apply topically to skin. It actually clears away toxic materials from the body. 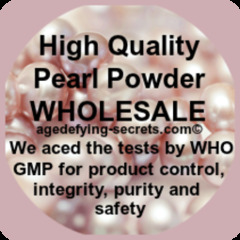 Chinese Pearl Powder is 100% Pure seawater Pearls specifically chosen for their health and beauty properties. Once the pearls are chosen they are disinfected, and then ground down into pure 100% Pearl Powder. It has a full compliment of about 18 amino acids, and over a dozen minerals, including 10 essential amino acids necessary for the human body to heal and maintain cell nutrition. It is high in calcium too! 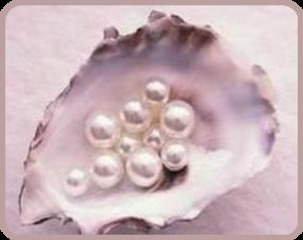 Pearl is also used as a major beauty tonic because of its rich source of amino acids. Amino acids contained in Chinese pearl powder include: Amino Acids, Aspartic Acid, Thronine, Isoleucine, Serine, Alanine, Phenylanine, Arginine, Methionine, Lysine, and Glutamic Acid, mucopolysaccharides, B-vitamins and a wide range of minerals including calcium, magnesium, zinc, iron, strontium, copper, selenium, strontium, silicon and titanium. Pearl contains calcium carbonate, magnesium carbonate, calcium phosphate, ferric oxide, silica. These essential building blocks of collagen and protein each have a specific function. Lacking any one of the key amino acids causes the skin to look dried, wane, depleted, old and wrinkled. Researchers claim that various components of pearl can stimulate the metabolism's activities of the genetic material in a cell - the DNA and RNA - thus promotes and accelerates the regeneration of new cells. Pearl Powder contains calcium carbonate and when taken internally, strenghtens bones, muscles and nerves. It reduces skin blemishes and rebuilds your health. Use it as a cooling beverage, taken with water, tea or juice. 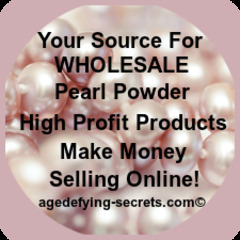 Pure genuine pearl powder does not totally dissolve in water or liquid, so be sure you stir as you drink. Put it in milk, tapioca, puddings, and malts. Pearl Powder can also be applied to the face as a beauty mask for rejuvenation and a flawless, silky complexion. It has special attributes for removing skin ulcers, melasma (which causes freckles, age spots, and dark patches on the skin), wrinkles, as well as nourishes the skin and makes it smooth, fine, elastic, healthy and naturally beautiful. Pearl Powder also contains natural sunscreens. The incredible benefits of pearl powder include: Healing, skin brightening, anti-wrinkling, and sun protection. Pearl Powder is used for calming the heart which relieves stress and anxiety, alleviates fear, eases frustration and anger, improves sleep and eases fatigue. Pearl Powder invigorates blood circulation and it is said that when Pearl Powder is made into a paste, heals rashs and boils. Pearl powder can also accelerate the healing of trauma, fasciitis, gastric and duodenum ulcers and stop bleeding. Studies have proven that Chinese pearl powder has effects in resisting aging, radiation & cancer and regulates the imune system.